A seasoned government and political influencer. A lawyer with years spent in public positions. A lobbyist with expertise in government and non-profit operations. 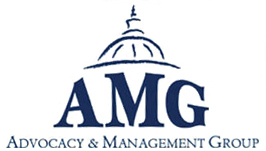 The leaders of the Advocacy and Management Group (AMG) combine a unique blend of public experience with a personal approach to help clients navigate the halls of Trenton and successfully influence key government decision makers. Relying on decades of combined involvement in New Jersey government, AMG gives a clear voice to the concerns and priorities of its clients.